The height of a chair is 18" off the floor. The height of a table is 30" off the floor. Ref: Useful Stuff 6: How to Renovate an Old Camper. The height of a closet rod is 60" to the center with 2" above the rod for the shelf. 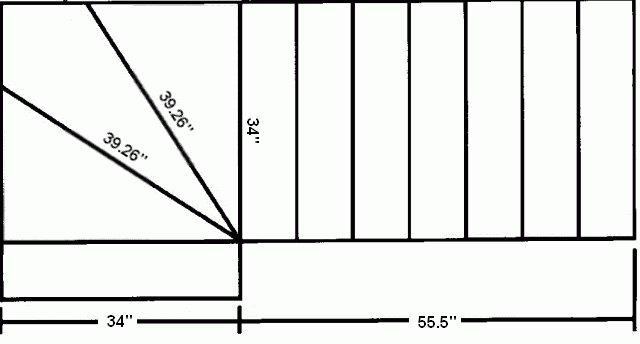 Ref: Remodeling 5: How to Install a Window in an Existing Wall. Hi Andre and welcome to our site. This is a very common question in older homes. Thanks for the photo. Ceiling height of the first floor? the hall space at the bottom of the stairs? if you remove the lower handrail, what is the distance from the bottom wall to the vertical wall where the handrail is attached? Is this job going to be inspected, can we cheat on the code, slightly? Is there room to extend the floor opening at the top floor? How will this affect the space below the stairs? How do you feel about winders? That should do it for now. Without changing the framing, you will have the same angle of stairs. Putting in winders or a landing won't help if the headroom isn't there. I even had one guy punch the outside wall out for a little foyer to help out his situation. So it really depends on how serious you are to get a good set of stairs. The winders are 30 degrees x 3 to make the 90 degree turn. Each winder is a step. I missed this top step business. This is a bad situation, but no other solution other than moving the door. If we keep the 12" step, we need to come up with 4". We could take 3" out of the hall at the bottom of the stairs - minimum is 34" and the run of that top step could be 11", then with the 1 1/2" nosing will end up as 12 1/2". Make sure you figure the run for your steps as 7.93 or 7 15/16". This is important. The inch and a half nosing is not part of the run, but the finished depth of the tread. It adds 1 1/2" to the final step, not added to each step. Yes, it is our Thanksgiving on Monday, lots to be thankful for. We are heading over to the Mainland of British Columbia, today. We live on Vancouver Island, about 26 miles off the cost of Vancouver, BC. Our two daughters live right there and the third one is driving down from Kelowna, in the interior. Good to be with family at Thanksgiving - three daughters and 8 grand kids; 5 grand kids will be there. On Monday we plan to drive to Bellingham, WA for shopping. Have a good Columbus Day! Those pics are amazing. I've never seen such a mess. Usually, the old houses were built very well. it seems these stairs didn't even have a stringer, except for the 2x4 , then built off of them. I would remove all that mess and start from scratch. Then you can check your measurements for accuracy. We usually put the drywall up first, for 2 reasons: 1. to stiffen the wall up so the jamb will be held securely and 2. to ease installation of the drywall. It makes it much easier to trim the drywall when installed over the door opening, then trimmed off flush with the jack stud or cripple. The chicken came first, by the way. You are good with the 22" slot. Come down a bit from under the shutters to allow enough room for the flashing. The flashing could fit nicely under the vinyl siding if that works. You need a minimum of 30" drop for 10' wide. Thank you Dave. Last question. Due to HOA requirements I think I might need to go with shingles instead of metal cover. Is the frame on your project strong enough to hold the required plywood's? Yes, no problem, just replace the 1x4 strapping for the plywood or OSB. It depends on the thickness of the treads. I am using PT 2x6 for treads. Okay, I would not go over 24" center to center. There is no actual code on this. When cutting stairs,should the bottom tread be 3/4 shorter if you plan on putting a 3/4 riser board on, for a finish look on my stairs.... Boston Mass. No the tread should not be shortened because of the riser. The riser affects every tread the same, above and below, which doesn't affect the run, as long as the same thickness riser is used from bottom to top. The bottom of the stringer is cut off, the same amount as the thickness of the tread, though. Building a set of kitchen cabinets is a project that requires woodworking skills. Building kitchen cabinets, considered part of a modern home decor, is the ultimate test of a finish carpenter's skill. The cabinet builder should be well versed in taking and relaying accurate measurements, in the operation of shop tools, such as the table saw, router and using a circular saw, both freehand and with a guide. The design of kitchen cabinets depend on the hinges used. The old style kitchen cabinets, with a face frame, used the classic Amerock hinges mounted on the face frame. Some hinges inset into the cabinet door giving a 3/8" thick overlap, others allowed the full thickness of the kitchen cabinet doors to overlap the frame. The concealed pin hinges were popular for awhile, making the cabinet doors flush with the frame. The doors were held shut with spring and roller catches. Finally, the magnetic catch emerged. Hinge design further evolved into a self-closing style, including artistic shapes and colors that forced everyone to re-do their kitchen cabinets. Our globe got smaller and European hinges came onto the marketplace. The design of these hinges revolutionized the kitchen cabinet industry. Frameless European kitchen cabinets were born. Cabinet doors could be easily adjusted three ways, drawers rolled easily on steel drawer slides, and there was no face frame to contend with.